Counting Down: WATCHMEN figures, Series 1! Some fans can’t wait, others dread the inevitable changes to their comic bible, and a great many more will be introduced to the characters and the events in Alan Moore’s WATCHMEN for the first time on March 6th. The movie stars Patrick Wilson as Nite Owl II, Malin Ackerman as Silk Spectre II, Jackie Earle-Haley as fan-favourite Rorschach, Jeffrey Dean Morgan as The Comedian and more equally spot-on casting choices complete the ensemble. Naturally, with something like this coming up, DC Direct has been working on a line of merch suitable to the tastes and high expectations of WATCHMEN fans everywhere. They’ve got busts and statues, 13 inch figures and 6 inch figures, all of which look great (though I personally prefer the detail on the smaller ones). Check ’em out! Ever since her breakout role in “Transformers,” 22-year-old brunette beauty Megan Fox has gained an enormous fanbase online. So it was big news this week when Wonder-Who.com revealed that she would be portraying DC Comics superhero Wonder Woman in an upcoming big screen adaptation. There’s only one problem: it’s a hoax. In the “Holy Trinity” of DC Comics superheroes, one iconic character has been conspicuously missing from movie screens. Superman had his heyday in the 70s, Batman in the 90s, and both have been revived in the past three years. But Wonder Woman, the Amazonian princess with the magic lasso and invisible plane, has not had a live-action portrayal since the last episode of the TV series aired in 1979. There have been attempts in recent years to put together a film version at Warner Bros. Pictures shepherded by Joel Silver, veteran producer of the “Lethal Weapon” and “Matrix” franchises. “Buffy the Vampire Slayer” creator Joss Whedon was attached to write and direct, but he left the project for “creative differences” last year. Then out of nowhere the Wonder-Who.com site appeared with an image of the Wonder Woman logo over an American flag with the words “The Truth Will Be Revealed!” below. As the days progressed, bits of the background were torn away to reveal the figure underneath. Finally, the image of Fox in full costume was unveiled, with DC Comics, Silver Pictures, and Warner Bros. logos in the lower right-hand corner. The site is very well done, with obvious but accomplished Photoshop work on the Fox photo. 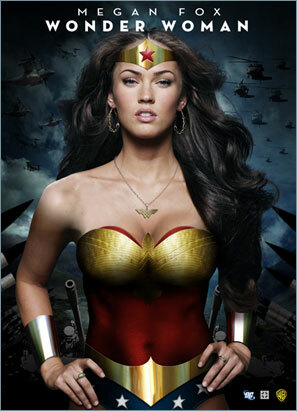 It’s also up in the air as to when the “Wonder Woman” film will happen. The studio had indicated that the character would be a part of the “Justice League” movie that was in development earlier this year, but that film has been put on hold as well. However, Wonder Woman is getting a direct-to-DVD animated movie (see below) from the same producers as the successful “Justice League: The New Frontier” and “Batman – Gotham Knight.” Featuring the voice of Keri Russell (“Mission: Impossible III”), “Wonder Woman” hits shelves in February 2009. Megan Fox will actually be seen next in “Jennifer’s Body,” a horror movie written by Oscar-winner Diablo Cody. 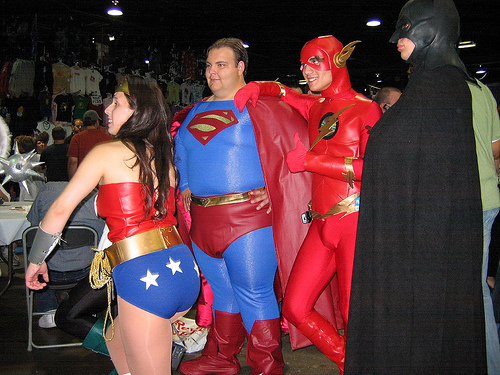 Wonder Woman and the JLA Boys: Superman just returned from Celebrity Biggest Losers and Flash looks a little frisking if you ask me.